Like this piece about wilderness survival, or this one about a folding bike. The pleasure of Real Cherry Coke but without the sugar, the guiltlessness of Coke Zero, but without the weird peppery taste. That took root in a concrete nook and remain defiantly lush and green all winter. I keep meaning to ask somebody what they are. That makes me want to scramble up a wall of Entrada sandstone. Being really tired makes the prospect of a 5 hour flight much less daunting. Chatty Patty is too bushed to make small talk, and I can be in downtown Manhattan before rush hour. Have Surfin’ USA and Kokomo become a little stale for you? Spotify the Smile and Pet Sounds Sessions to enjoy hours of backing tracks, isolated vocals, and scrubbed takes of some of the greatest Beach Boys tunes. The Missus and I were too busy to catch shows like Heroes and Prison Break during their TV runs a few years ago. We’re even busier now, but when we do snag an hour of couch time, nothing beats no commercials and no wait between episodes. I can almost forgive them for those incessant online pop-under ads. Almost. The scent of which reminds me of the the bug repellent Mom used to to slather us with on summer camping trips to the Manti-LaSal National Forest, just before sunset. Dear reader, please note the ‘Random Musings’ tag on this post. No cool historical discoveries are contained herein. No trail tips, no factoids about ghost towns or Saltair or bands I’m strangely obsessed with as of late. Heck, I’ll even forgo my usual punctuation and style checks before posting. Sometimes you’ve got to jam and let the notes fly where they will. Writing is a difficult art, especially when there are deadlines involved. But let me clarify. Deadlines get a bad rap. Deadlines are what make writing actually occur. Were I to inventory the most popular articles on this website, chances are they were all written against hard deadlines. But deadlines can also make writing seem like a job or chore, a perception that can spell creative doom. Writers begin writing because there’s something fulfilling—even cathartic—about being able to translate thoughts and concepts into paragraphs that might interest somebody somewhere. Too often, however, the creativity that spawns the desire to write is dulled by deadlines, word counts, and prescribed formulas—until the art is no longer expression of concept. The art is figuring out a way to express concept to an acceptable degree within the parameters of formula, all prior to deadline. It’s very easy to think too much when writing. Frankly, thinking gets too good a rap. Thinking is procrastination’s lamest excuse. Over thinking during the writing process can quickly lead to over-meticulousness: Gotta word that lead just right. Gotta make sure the nut graph is placed just so. Gotta search my website the words “which” and “storied” to ensure I’m not making inordinate use of them. Because somebody will certainly notice and cynically recall it every time a new Bonneville Mariner post appears in their RSS feed. All of this begets fatigue, which begets a weird, subconscious aversion to writing. I find that even the specter of fatigue can steer me away from journaling a thought, and that’s too bad. How many fleeting thoughts—obscure, profound, or anything in between—go completely undocumented? Take a thought I had yesterday about Florida, for example. Somehow, amidst all the meetings and emails and errands that dominate my brain cycles, my mind turned for a vivid moment to a nondescript tract of land between the Magic Kingdom and EPCOT parks at the Walt Disney World Resort, which I’ve crossed many times but never actually set foot. The only way to see it is to ride the Disney World Monorail between the Ticket and Transportation Center and EPCOT. After leaving the TTC, the monorail route roughly parallels the road to EPCOT, weaving in and over a thick patchwork of swamp and subtropical forest. The scenery itself isn’t unique. Sandy ground dotted with saw palmetto, tall pines of some variety and moss-draped cypress—it’s the same flora that blankets most of the Sunshine State. The difference lies in perspective and context. These forests are usually seen from road level or from an airplane window thousands of feet in the air. The monorail cruises at a maximum of 40mph about 50 feet of the ground, often at canopy level. The perspective isn’t mind-boggling; it’s just different. I can’t quite wrap my mind around the fact that so many acres of pristine forest exist between two of the most visited theme parks on the planet. Aside from the main roads, no public roads cross this forest; only double tracks used by the occasional service vehicle. It’s a birder’s paradise. Deer, armadillos, and even alligators can be spotted along the 3 mile corridor. I’ve taken photos through the monorail’s windows, but they don’t do it justice. The part of me that automatically equates anything lush and “jungly” with happiness longs to wander through this forest. If I could, I’d bushwhack westward from World Drive 2 miles through the heart of the forest to the Port Orleans Resort. I’d start early on a spring morning with Camelbak packed with camera gear, Pop Tarts, a sidearm, and reservoir filled with slushy coconut water. I’d wear high boots for the snakes and a long-sleeve hiking shirt for the bugs. I’d fashion a makeshift walking stick from a downed slash pine branch and use it to ford the canal near for forest’s eastern edge. I might be bleeding and exhausted by the time I walked through the Port Orleans’ front doors, but I’m pretty sure I’d be happy. I’ll probably never make that jaunt. Legal red tape aside, the logistics alone would make it darn near impossible. But a man can dream, whether from the safety of the monorail’s cabin or between meetings in Utah. And he’d be remiss if he didn’t at least write a blurb about it on his blog. Or at least we were the Utah equivalent of the Polynesian term for someone whose life, as surf legend Chris Malloy once put it, is dictated by the ocean’s moods. A waterman swims, dives, surfs, and spear fishes. He lives in and for the sea. Our seas were the lakes and streams along the Mirror Lake Highway in northeastern Utah. Each summer, a sequence of family camping reunions allowed my cousins and me to escape to our aquatic Shangri-La in the Uinta Mountains for days on end. Matt, Adam, and I learned to swim at a young age in the frigid waters of the Upper Provo River. Our older cousins Tommy and Josh taught us how to safely ford rapids and properly acclimatize to cold depths. Eventually we learned to fashion rafts out of driftwood and catch rainbow trout with our bare hands. Matt had a Sony Walkman with a pair of portable speakers. The happy, surf-centric harmonies of the Beach Boys provided the soundtrack for our adventures. We’d belt the chorus of “Surfin’ USA” as we tossed a Frisbee over the river between Coney Island and Waikiki. Many of our landmark names came from Beach Boys tunes. When Uncle Garth bought a power boat, our turf extended to Rockport Reservoir, an impoundment along the Weber River. Time not spent water skiing was passed lounging on a wide beach on the lake’s north side. Adding to my delight was the fact that our annual trip to Rockport coincided with my birthday. Water, sand, campfires, and birthday presents—it couldn’t get any better! One year, Tommy’s wife, Shanna proudly gifted me a New Kids on the Block album on cassette. Later, Tommy pulled me aside and discretely handed me another album, The Beach Boys’ Still Cruisin. I don’t swim in rivers much these days, but I pine for my waterman days—for the loud rush of the Provo, the glow of a Soapstone campfire, the lazy days on Rockport’s beaches. Those times epitomized summer for me, and so did the tunes. That’s why every year around this time, I get an irresistible urge to crank The Beach Boys and head for the mountains. No TV show makes me laugh like SpongeBob SquarePants, perhaps because of its producers’ ingenious knack for capturing real life concepts in hilarious caricature. One of my favorite episodes is a gem from season 2 called “Procrastination,” in which our boxy protagonist is assigned to write an essay for his boating school class. Though the assignment is fairly simple, SpongeBob is dogged by that Dreadful Trinity of procrastination, rationalization, and distraction that writers know so well. Sure, mock my love for a ridiculous Nickelodeon show, but I dare any writer to watch this episode and tell me it doesn’t hit home. Writing ain’t easy. When writers say they love writing, most of them are talking about a very specific stage of the process—that magical moment of clarity that I call “The Zone”—when everything starts to gel and thoughts begin to flow smoothly from cerebrum to keyboard. It’s the writing equivalent of a runner’s high. For a lucky few writers, The Zone comes quickly. For the rest of us, it lies near the end of the ordeal, often just shy of deadline, when the 12-pack of Diet Dr. Pepper is just about gone and the kids are ready to trade their old Dad in for a less frazzled, non-deranged model. When it finally comes, The Zone is heaven. Most everything leading up to it—second guessing on sentence arrangement, the trial and error of cadence, the simple point that should take minutes to articulate on paper but inevitably takes hours—is hell (hence all the procrastination, rationalization, and distraction beforehand). Wait until the last moment possible to begin writing, then justify the procrastination by rationalizing that my extra effort in research will make the writing process painless. Grab a Diet Dr. Pepper. Sit in my writing spot and stare at the blank Word doc. Plink out a couple draft sentences. Check my email. Think about the movie I saw last night, wondering what other movies the lead actress has starred in because she seems so familiar. Check IMDB.com and discover that, oh yeah, she was the voice of such and such character in that one cartoon, which is why I recognized the voice but not the face. Makes sense now. Back to the Word doc. Compose my lead paragraph, then agonize over it. This calls for another Diet Dr. Pepper. And a Pop Tart. Better check email again, just in case my source had some last minute thoughts. Nope, but it looks like Tyler wants to go to that German place downtown for lunch tomorrow. Should be cold and snowy tomorrow—perfect weather for German food! I’ll probably order the spätzle. Good stuff. I wonder how they make it? Back to the draft because even my most optimistic analysis of my remaining time says I’ll be cutting it close. Bribe my brain to focus by promising a break after I finish the next 3 outline points. Realize after finishing the 5th outline point that my break’s overdue. But that’s okay, because I’ve now entered The Zone. It’s all downhill from here. I love this writing thing! If there’s a shortcut to The Zone, I have yet to discover it. I’m writing a piece for the Transcript Bulletin today and tomorrow (or maybe tonight and tomorrow—or just tomorrow) and I’m formulating my strategy. Perhaps writing this post about the Dreadful Trinity will help to inoculate me against it. And I might try disabling the WiFi before getting started. Right after I grab a Diet Dr. Pepper, check my email, and watch that hilarious SpongeBob episode one last time. It’s so wonderfully charming when it first shows up and it turns the whole world into a magical wonderland. But by the end of March/early April it simply will not go away. It won’t listen to reason or acknowledge the obvious- that the Equinox is past, Spring has begun, and your relationship is over. Winter, we are done. What we had was truly wonderful. But it’s over; we’ve grown apart, and it’s time for both of us to move on. I need to bike and camp and sit out on the deck, and you need to go see the penguins down in Antarctica or do whatever the hell it is you do the rest of the year. What is your favorite ghost town? Last month this month I mentioned a couple projects I’ve started. The first is a book I’m writing about Old West ghost towns, which will be out from Shire Books/Random House this fall. This opportunity is a dream come true, and I’m amazed at how things fell into place. I’ve been enamored– nay, obsessed– with ghost towns for well over a decade. I’m excited to share this passion in book form. I’ll post more about this in the coming weeks, but I wanted to take an opportunity to crowd-source a little. For various reasons, I’ve narrowed the focus of this book to ghost towns from the Old West era. The goal– to explore the concept in an Old West context: What are ghost towns? How did they rise and why did they fall? What’s the secret of their appeal? To that end, the book profiles several key western ghost towns in detail and many others in partial detail. It will include lists and as many photos as I can pack in. The detailed profiles are done, but I have room for a few more mentions and thought I’d ask your opinion before finishing up. So here are my questions to you: If you were to list your favorite ghost towns, which would you include? Why? Is there a town you’ve been fascinated with but is virtually unknown or underrated? What’s the most photogenic ghost town? The most bizarre? The most intact? Feel free to comment here or email me at bonnevillemariner@gmail.com. I took this photo just after a thunderstorm and just before sunset on Saturday. The mountains in the background are the Oquirrhs. The thin strip of khaki separating them from the waves is the lake’s eastern shoreline. Even more interesting than what this photo shows is what it doesn’t. 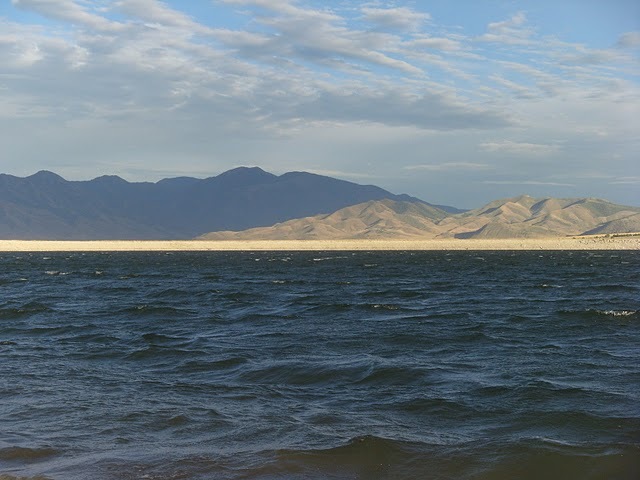 Because of the lake’s situation in the Stansbury Mountains foothills, the entirety of Tooele Valley– along with all of its roads and towns– is completely hidden from view.